Explicit inclusion: If the exact members of the constraint reference set are also included in the master reference set. Extension: If the members of he constraint reference set are not included in the master. Subsumptive inclusion: If members of the constraint reference set are subsumed by the members in the master. This is useful when developing reference sets for use in information models, where different information models may further constrain a reference set for a particular domain. Relationship: If there is a source-destination relationship between the constraint reference set (source) and the master reference set (destination). Use the Browse.. button to select a reference set, and Next to start the comparison. The comparison just takes a few seconds, since the comparison engine utilizes all available processing cores to speed subsumption calculation. 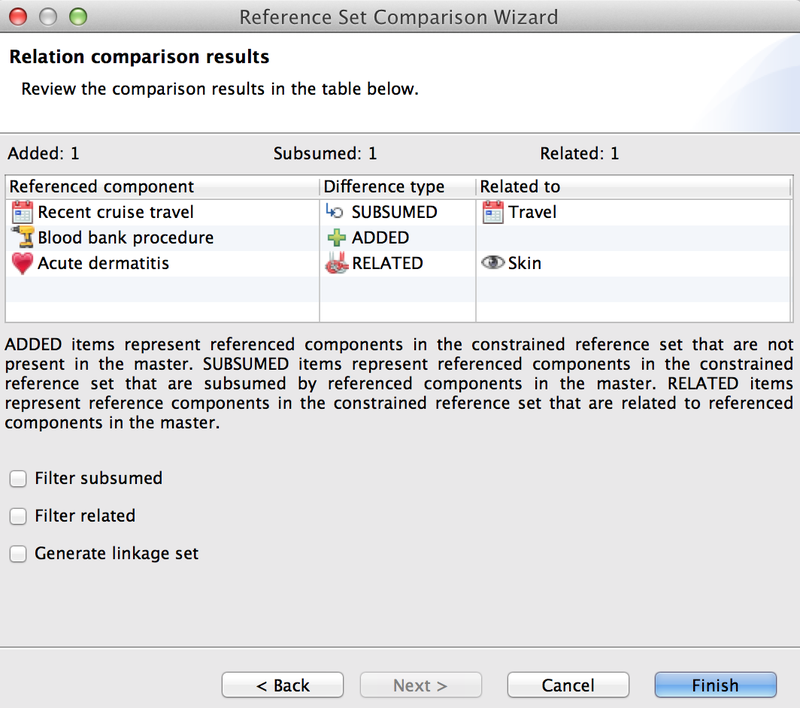 After the comparison, you can review the differences between the two reference sets. 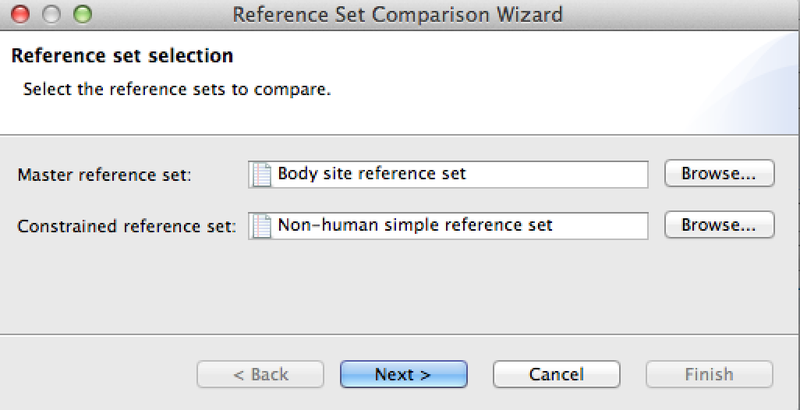 ADDED items represent referenced components in the constrained reference set that are not present in the master. SUBSUMED items represent referenced components in the constrained reference set that are subsumed by referenced components in the master. 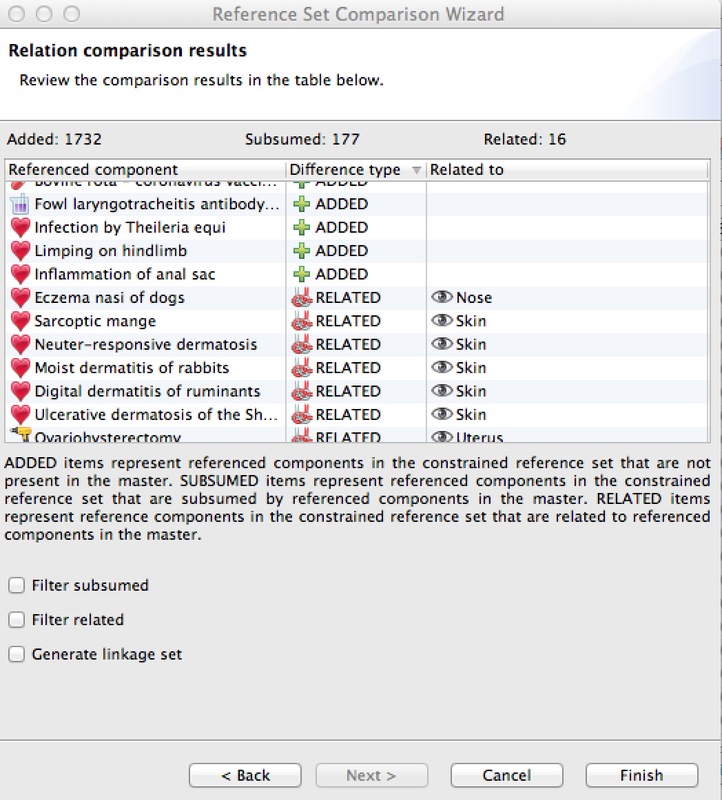 RELATED items represent reference components in the constrained reference set that are related to referenced components in the master. Filter subsumed: Hides subsumed components. Filter related: Hides related components. Generate linkage set: Creates a linkage set (see next section). If subsumption (subsumed) or relationship (related to) is indicated in the comparison overview, a linkage set can be generated. This is a simple type reference set that contains the relationships between the members. An example for subsumption would be Recent cruise travel IS A Travel. Check the box for Generate linkage set and click Finish to start the process. Note: The action for generating a linkage set will only be enabled if subsumption/relationship is found between the members. The name of the linkage set consists of the names of the two reference sets that were compared, the expression reference set linkage set is appended. You can find it in the reference set view as a simple type reference set. Double-click the name to review it in the reference set editor. The first column displays the referenced components and their relationship. In the screenshot below, an Is a relationship between Inactivated influenza split virion subtype H1N1v-like strain adjuvant vaccine and Inactivated influenza split virion vaccine is referenced.